Today on board the Aurora we headed out to the southeastern edge of Stellwagen Bank. Over the past couple of weeks the whales have been moving farther east making a much longer trip for us to reach them. But we did reach them in beautiful conditions. There were some other vessels out whale watching that we had to share the whales with but we got great looks for several groups of humpbacks feeding, minke whales, and even a very curious grey seal. We first spotted some kick feeding activity which turned out to be Glo-stick and her calf, but this pair were very elusive so we ended up with Grackle and Tongs and calf. The two adults were making bubble rings and coming up opened mouthed. It seemed like they did a lot of straining of the water out of the baleen at the surface which gave the swarming gulls a handy perch! A new whale, Canine, joined this group as they started to travel, perhaps searching for fish in a wider area. Canine is a new whale for me this season. This animal’s tail pattern has changed a fair amount from the one in the catalog which can make identification a bit trickier. 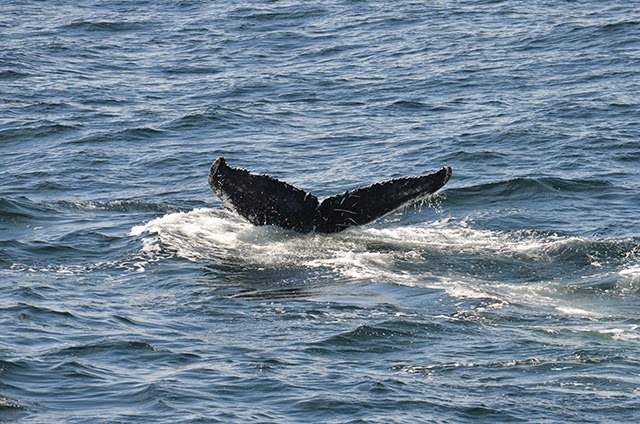 We finished off our trip with quick sightings of several other humpbacks as we travelled out of the area. One of these I even managed to get a photo of and turned out to be Pepper! It was a beautiful day on the water. On board the Cetacea, we traveled far to the southeast corner of Stellwagen. Once there we found Pepper. She was bubble feeding near the surface. It’s always great to see her out on the bank because she was one of the first cataloged humpbacks on Stellwagen, first spotted in 1976, making her at least 38 years old! Next we moved a short distance to view Tornado and her 2014 calf that were also bubble feeding. Tornado was exhibiting her signature flipper flare kick feeding and bubble cloud feeding technique. I wonder if other humpbacks will exhibit this unique behavior learned from her in future seasons. 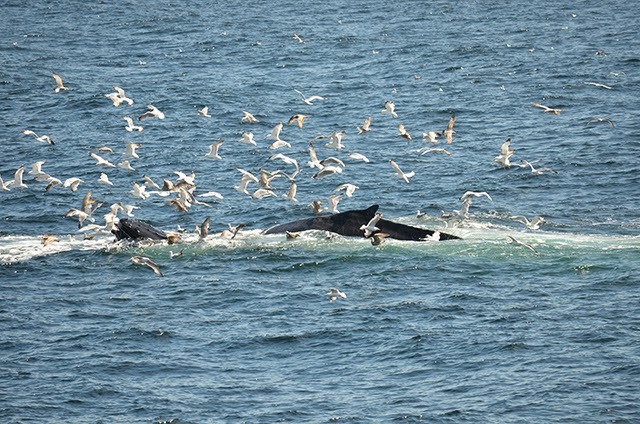 The herring gulls were swarming above the whales in large numbers today, trying to catch some escaping sand lance. It looks like there were at least 100 gulls, but probably more, above Tornado while she was feeding! 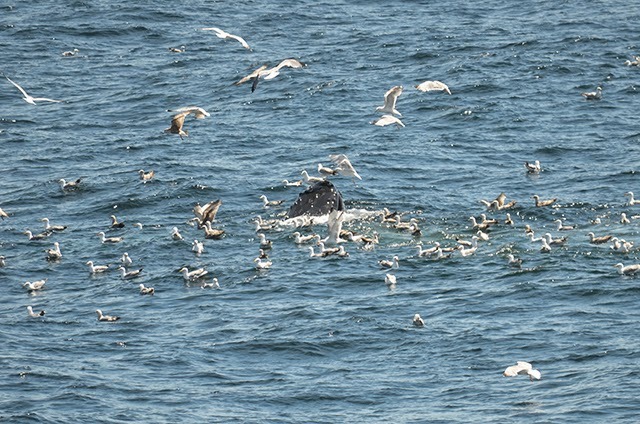 In the distance, we noticed that Pepper joined up with another humpback to do some feeding, but we never saw the fluke of that unknown individual. Also during the trip, we had a quick swim by from a minke and finback whale. Later that afternoon, we tried an area we hadn’t been to recently, mid-bank just north of the shipping lane. After a little bit of searching we found two humpback whales, Geometry and Measles. The two were doing 5-7 minute dives followed by one large bubble cloud at the surface. Passengers loved seeing the rolling behavior during the feeding and getting a glimpse of the animal’s large pectoral flipper. Even though the pectoral flipper looks very flexible, it actually has bones in it. If you were to see a skeleton of a humpback whale, the pectoral flipper would look like modified hand bones, showing close relation to us and other land mammals.